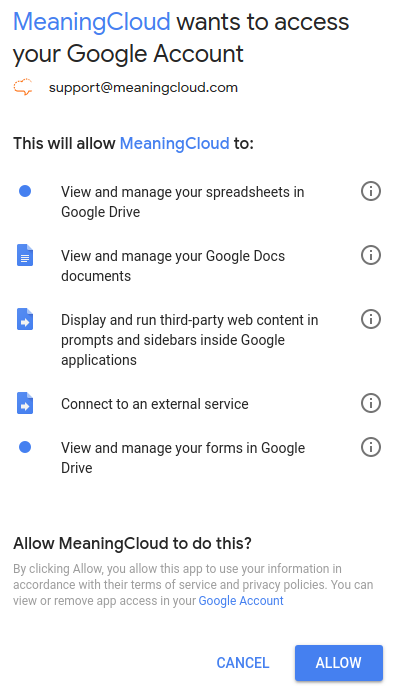 Follow these steps to setup the MeaningCloud Add-on for Google Sheets in your Google Drive environment and start working. First, get MeaningCloud's add-on from the Google Web Store. 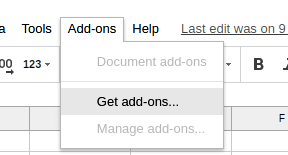 In order to do it, open your spreadsheet and click on Add-ons>Get add-ons..., or just access the add-on directly. This will lead you to a dialog that allows you to search for add-ons in Google's web store. To find MeaningCloud's add-on, just use the search box on the upper-right corner. Once you've found it, install it by clicking on the "+ Free" button that appears when you hover over it. For the add-on to work correctly, you will need to give it access to some sections of your Google account. Just click on ALLOW to finish the installation. If you go back to your spreadsheet and click on Add-ons, MeaningCloud's add-on should appear listed. MeaningCloud's add-on can be removed as any other add-on in Google Sheets: just go to Add-ons and click on Manage add-ons.... Find the add-on you want to remove from the list and then click on the Manage button: you will be shown a list of options, including Remove.